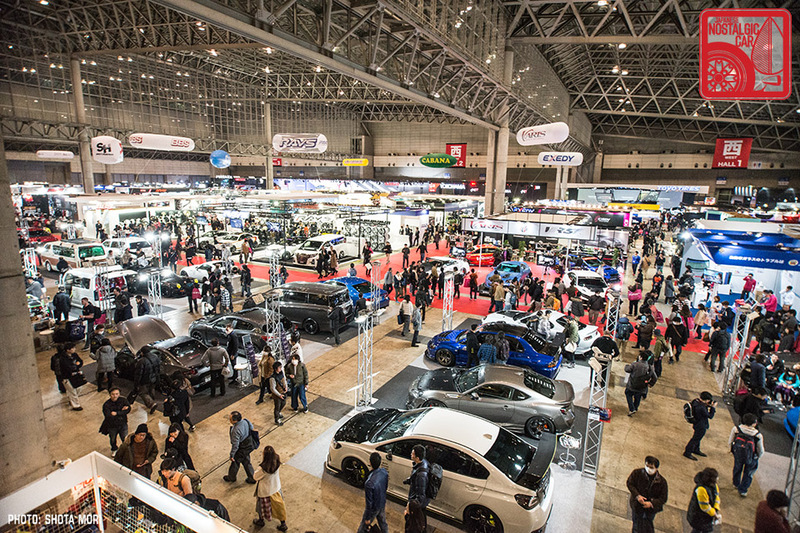 In the past, the Tokyo Auto Salon has been pretty easy for us to cover. The show is still geared towards cars on the cutting edge of performance tech and style, so true chrome-bumpered classics were fairly thin on the ground. 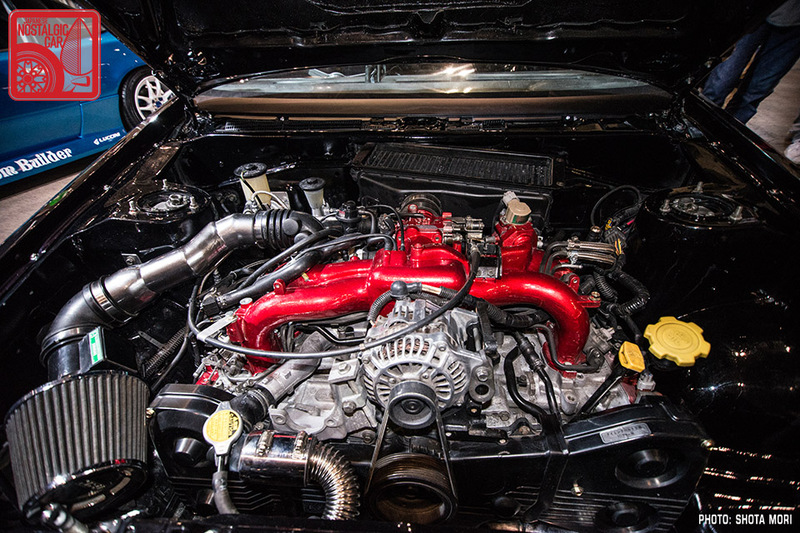 However, as time marches on more and more cars from the golden age of tuning fall within the 25 year threshold, the scope of what JNC covers has grown as well. 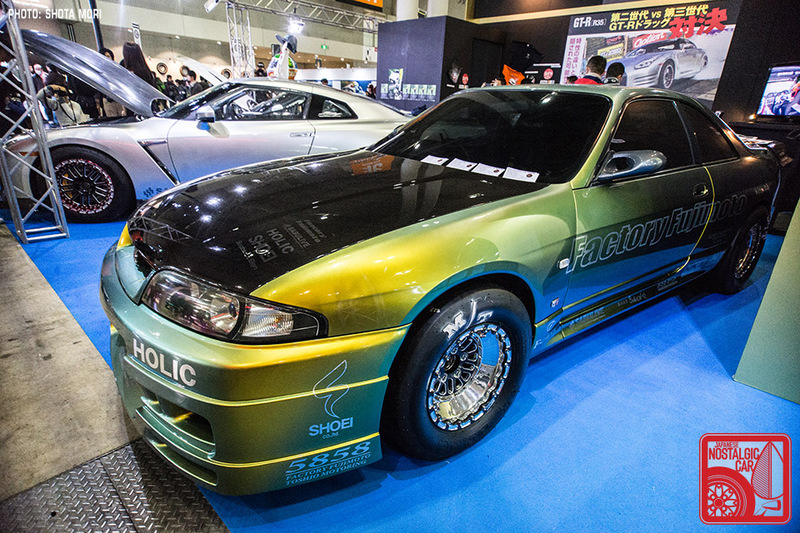 There were a lot of highlights at the Tokyo Auto Salon, but there was even more stuff we didn’t have time to feature. Rather than let those images go to waste, we are throwing them all into this catch-all for you to peruse. Every year G-Works takes a project car and rescues it and publishes the progress in the pages of their magazine. 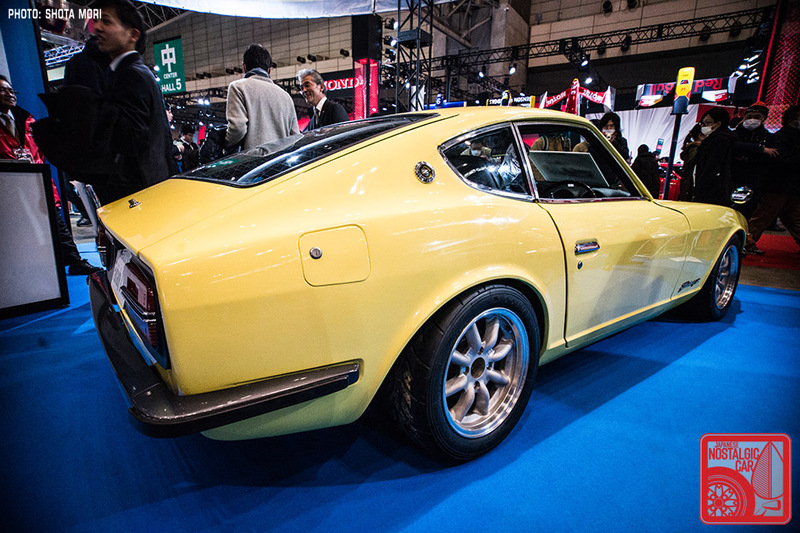 In the window of this year’s S30 Fairlady Z project, you can see the “before” image where it was little more than a primered shell. The pale yellow Z is unique in that it is a G-nose without flares. The ZG bumpers in gunmetal gray are a perfect match with yellow. 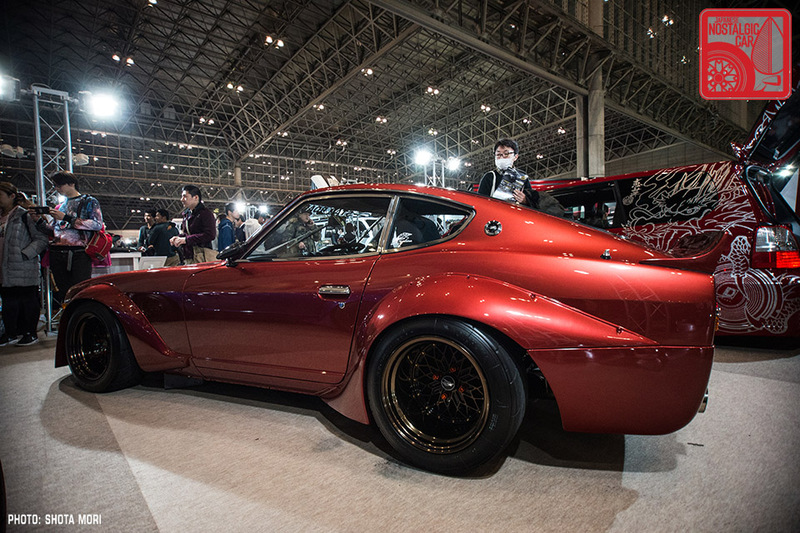 In previous years, G-Works gave us a bone stock S30 Z, kenmeri GT-R, and a cool multi discipline maroon Z. They clearly have an affection for Nissan. 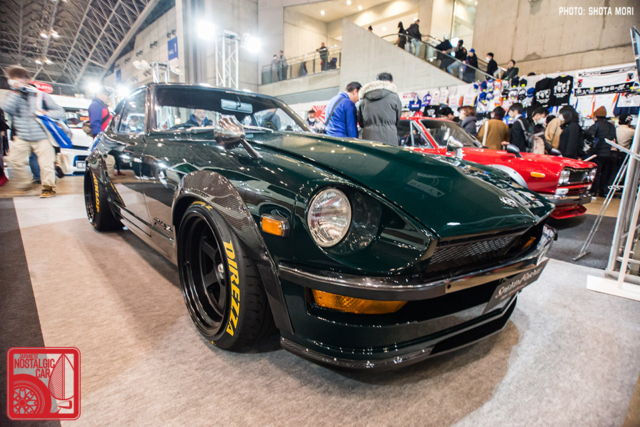 At the Star Road booth were a pair of familiar faces, twin S30 Zs wearing the shop’s Fighter body kit and powered by L28s bored out to 3.0 liters. Aggressively modern, the kits lend the cars an unmistakable presence. 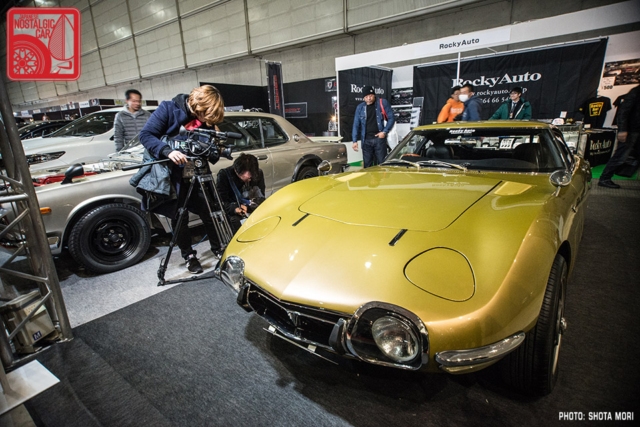 The beauty of a Star Road car is that they are meticulously tuned and developed so that you can drive in modern conditions, idling and creeping along in Tokyo in traffic, all while still running carburetion. Oh, and you have air conditioning too. At first glance the AE86 by Wiz Custom Builder was your standard Trueno build, with TRD N2 flares and the new Work Equip 40 wheels. But when you got to the front and peeked under the hood, it was anything but. 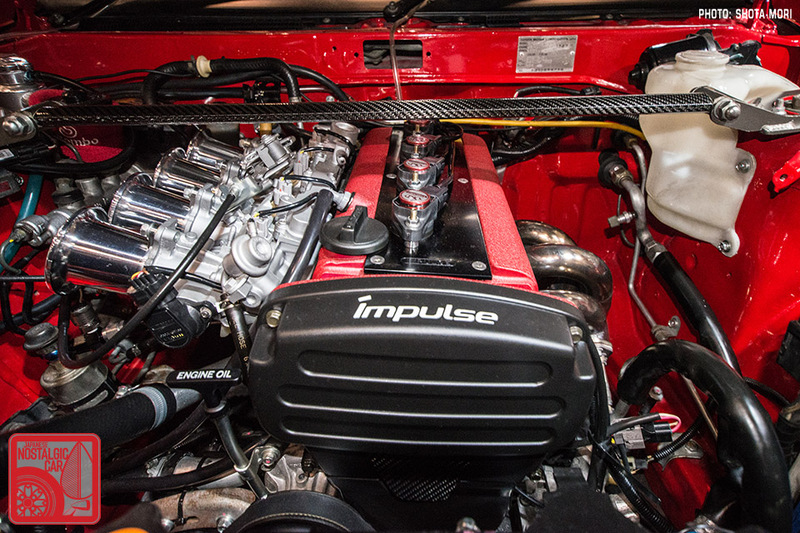 What better way to show off the FA20 that powers the Toyota 86 than by installing it in an original AE86? 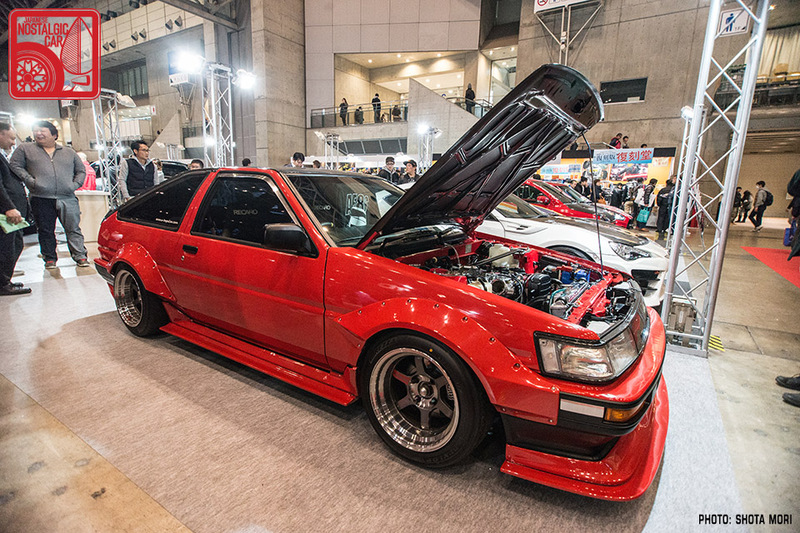 With the lightness of the AE86 chassis combined with the Subaru boxer’s lower center of gravity, the swap makes sense. Plus, the 2.0-liter flat-four makes about the same power as a healthy built 1.6-liter 4AG. 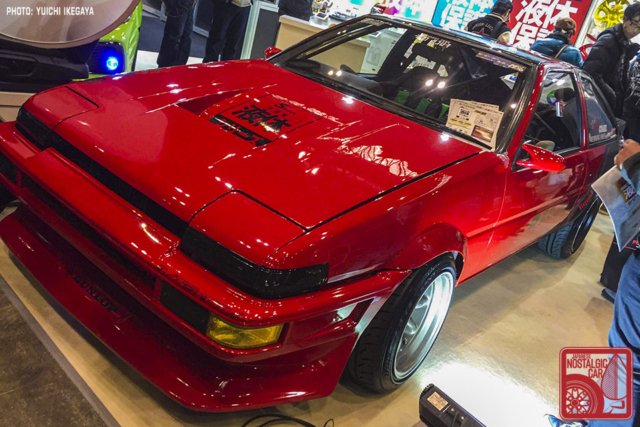 AE86 specialists RK Factory returned with a resto-modded Hachiroku that, if you squint, might look like has a 70s vinyl top. 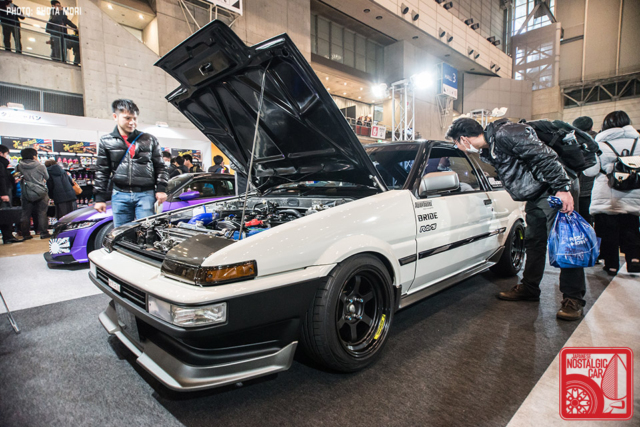 The Fukuoka-based shop sells carbon-fiber and replacement interior parts for the AE86, such as door panels, dashboard, carpets, hood, and door guard strips. The front lip and side skirts are a shop custom as well. While they don’t make much in the way of performance parts, the shop can build and tune the 4A-G. 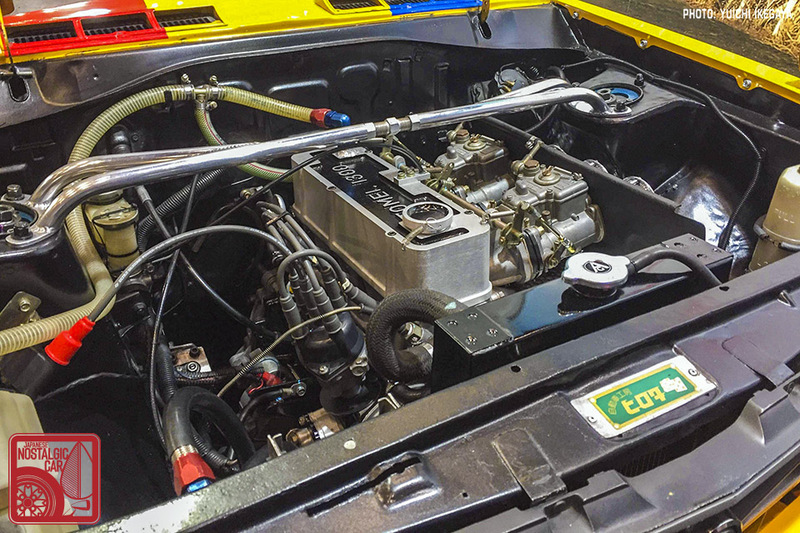 The demo car has been fitted with a 20-valve with an Adaptronic ECU and direct-ignition system. 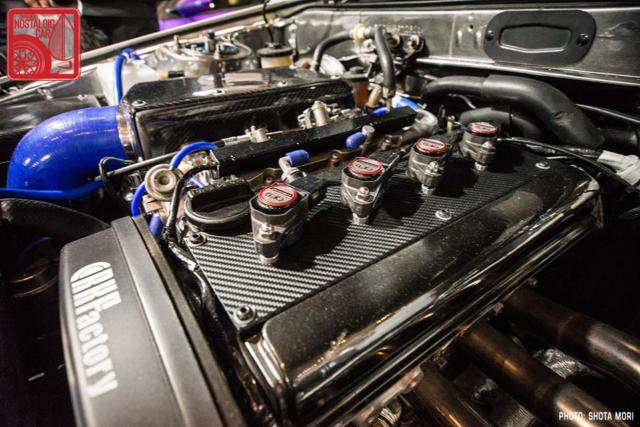 The valvetrain features a 264-264 high cam with reinforced valve springs and a 0.8mm metal head gasket. Exhaust is channeled through a Toda header and HKS exhaust, while power runs through a Toda flywheel and clutch and TRD 2-way LSD. Another modern interpretation of the Hachiroku was the Impulse AE86. 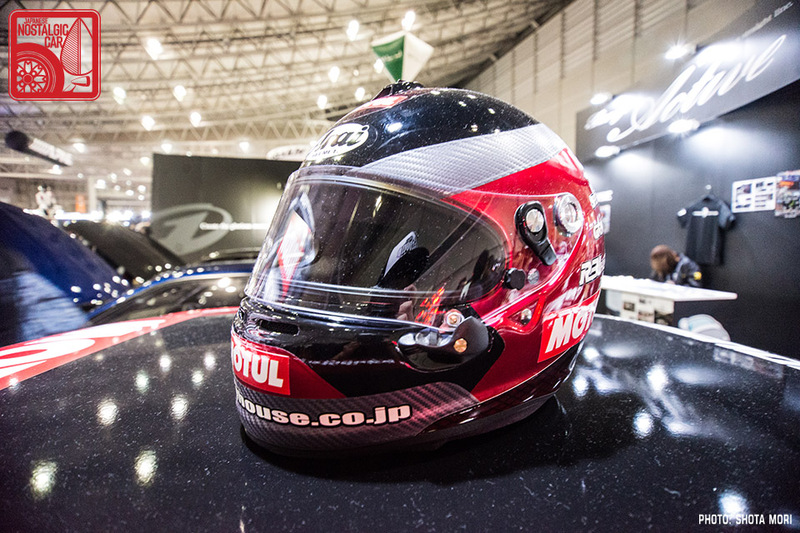 The Kobe-based tuner offers a variety of race and carbon parts for Toyota’s famed drift machine, with the latest being a carbon roof panel. The engine of course is a 20-valve with individual throttle bodies. 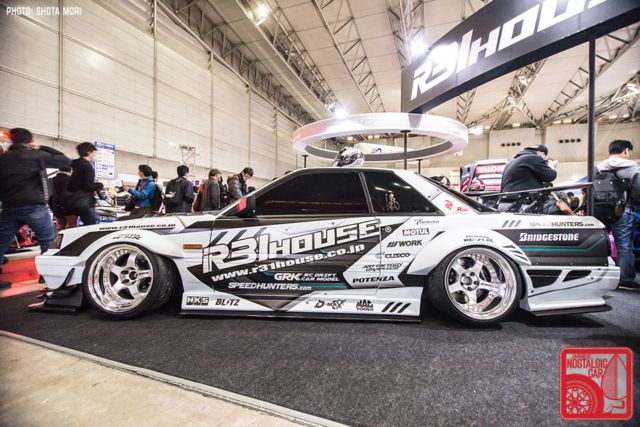 The kit is one of the company’s own design, called the Impulse N2 Wide Body. 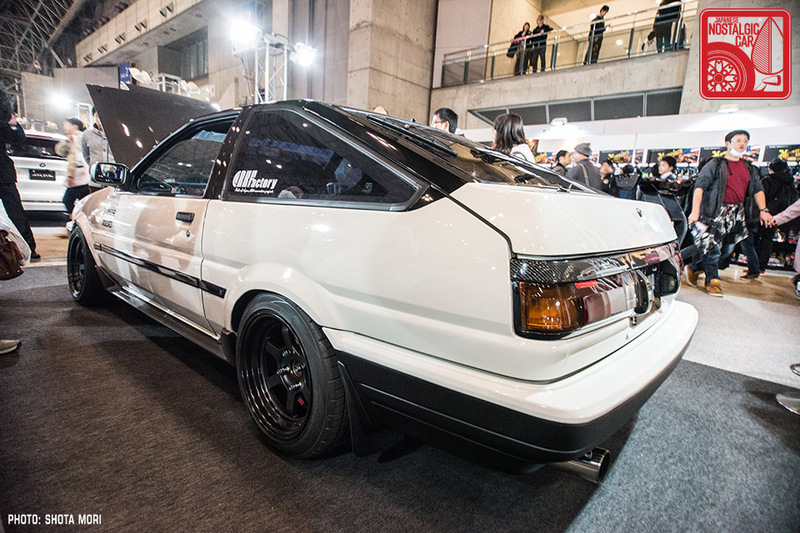 It’s a modern take but fits nicely with the AE86 aesthetic. Naturally, it runs on Rays TE37s, the national treasure of Japan. 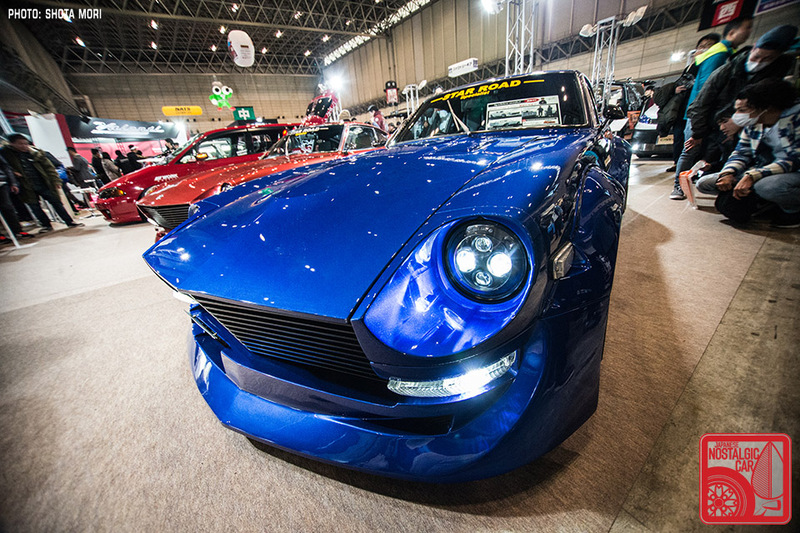 Osaka’s SpeedForme came last year to show off their body kit for the S30 Fairlady Z. This year, they returned with a green example wearing the same kit. The front air dam is an evolution of the one seen on countless Zs, a modern piece but one that doesn’t disturb the period essence of the car. The rear skirt is ingenious because you can run with or without the bumper. 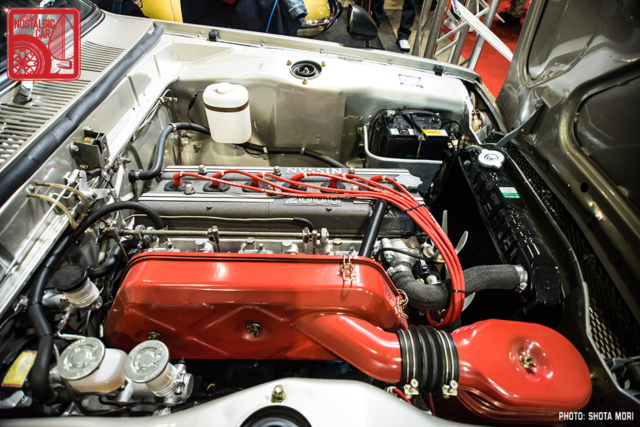 Though it wasn’t there to showcase it, the engine was a stroked 3.1-liter L-series. 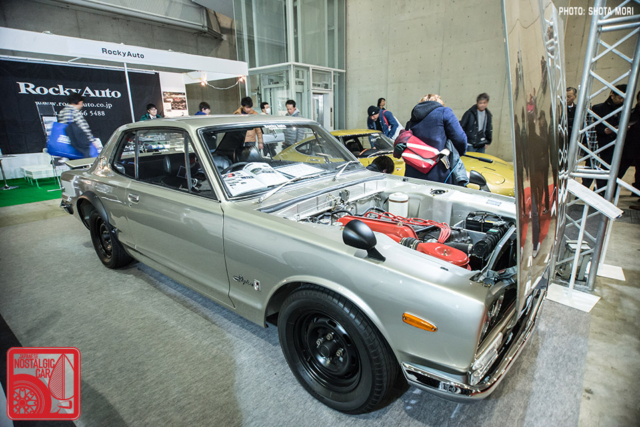 This time they also brought along a new kit for the hakosuka Skyline. 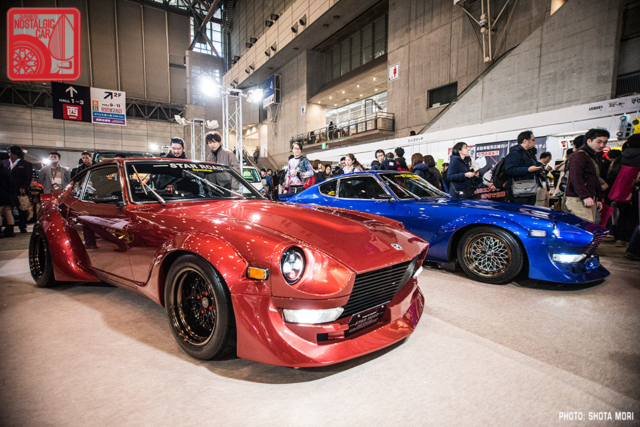 As with the Z, it gives the cars a somewhat pro touring look. The panels and flares lend themselves to large wheels — 17-inch TE37s, of course — and offer a hint of modernity. 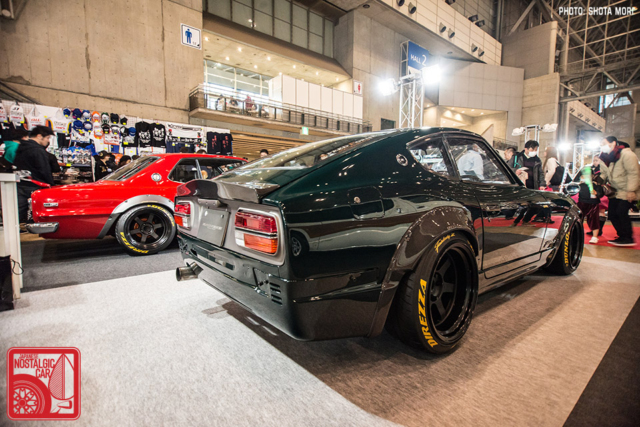 Noee the way the rear flares wrap around the surf line. The fitment is impeccable. In the pantheon of AE86 builds, the Run Free Sprinter Trueno is one of the most famous. 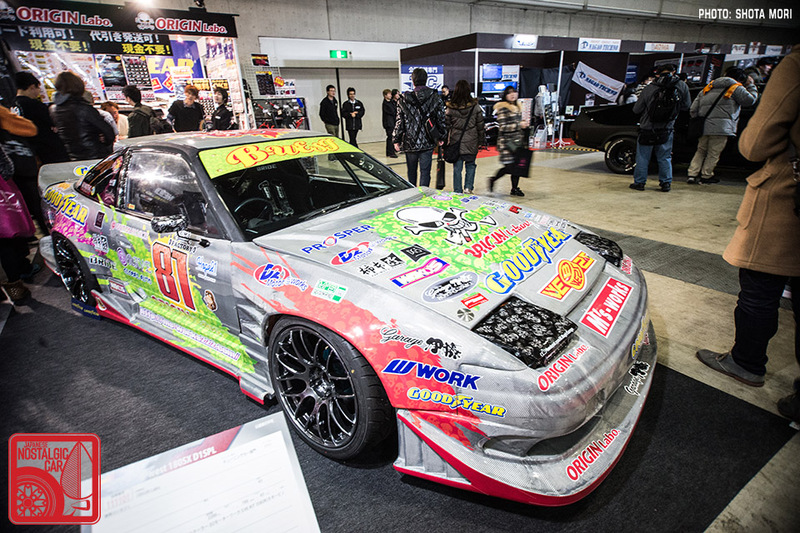 It’s been around since the 90s, when drifting was first surfacing from its underground roots. 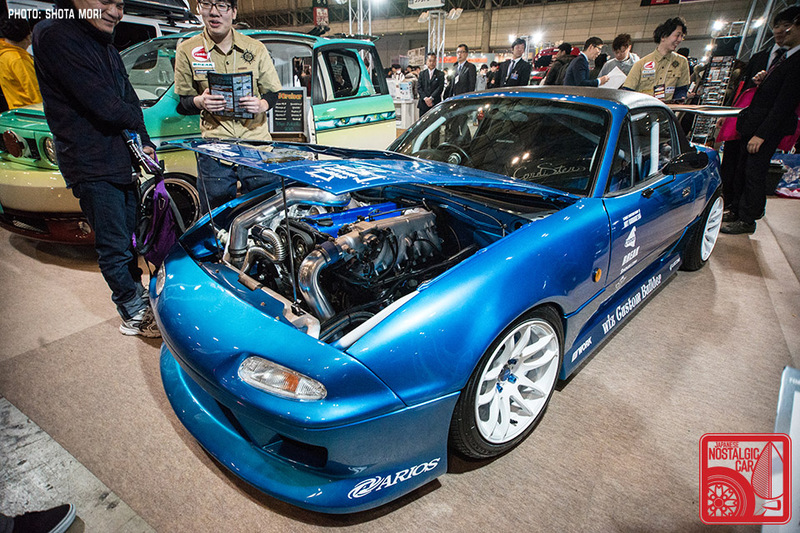 The Toyota JZ-series engine is like the LS V8 of Japan, so if you want to 2J all the things, here is a 2JZ-powered Miata. It still appears to use the Miata suspension, but a tube frame was required to make space for the ancillaries. It’s all a bit bonkers, and back in the 90s I probably would have dismissed this stuff but now it’s rarer and has novelty value. 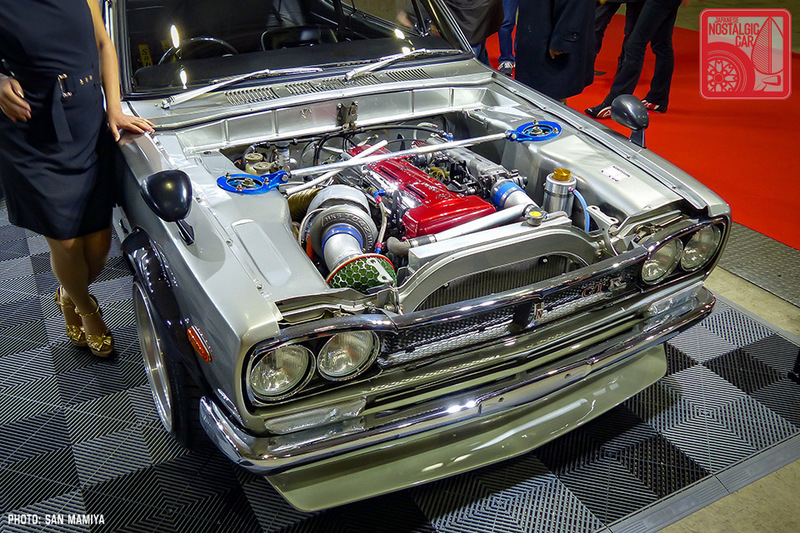 The 2JZ even fits into a Hakosuka. This is perhaps sacrilege to some, akin to putting a small block Chevy into a Mustang. But, Toyota’s legendary straight-six is accessible, bulletproof, and and fits like a glove. Nagoya’s Rocky Auto is known for its outrageous builds, including a Lexus V8-powered Hakosuka and other blasphemous works, but this year Rocky-san brought out his stock and mint KPGC10 Hakosuka GT-R, from his personal collection. 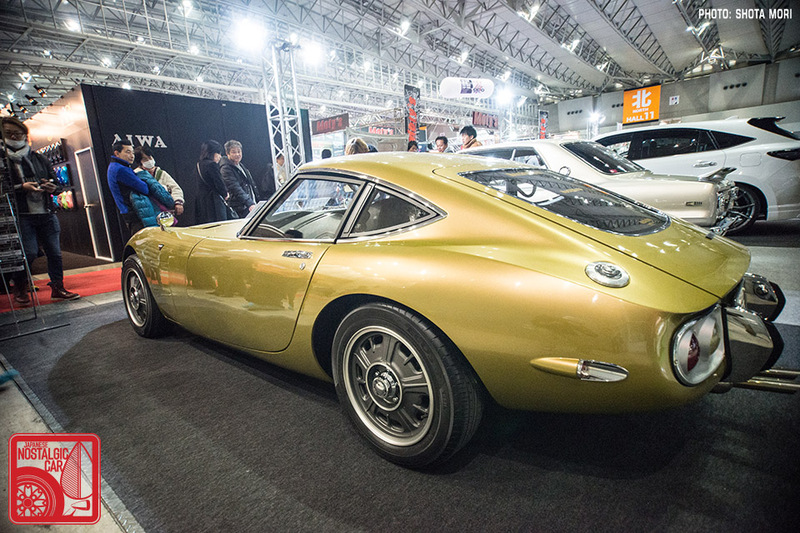 At the other end of the spectrum was Rocky’s hand-built and all-new 2000GT replica. Shaping the 2000GT’s beautiful metalwork was challenge enough, but recreating all the chrome must have been a monumental undertaking. Gold, the same color as the one owned by Twiggy, was the rarest 2000GT hue with only three made. Thanks to Rocky-san, the world has one more. 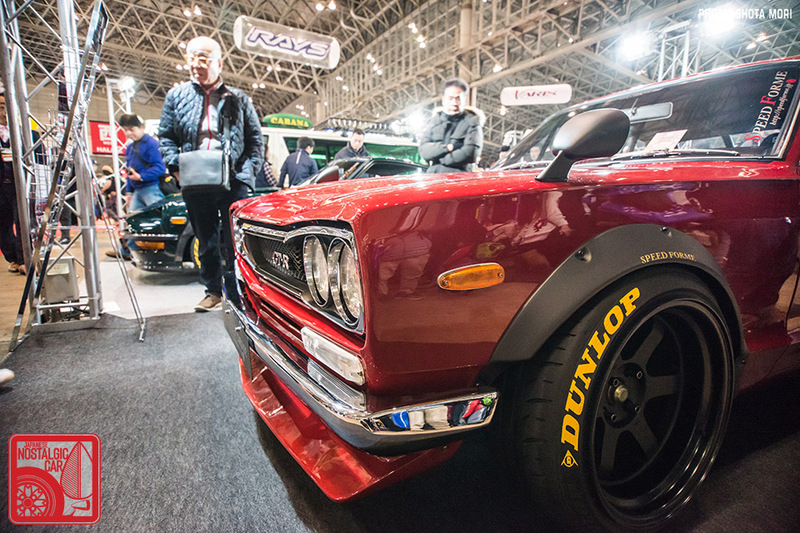 Obayashi Factory brought out a relatively tame offering compared their previous Auto Salon builds like the lowrider 31 Cedric or Kenmeri-nosed Nissan Cube. 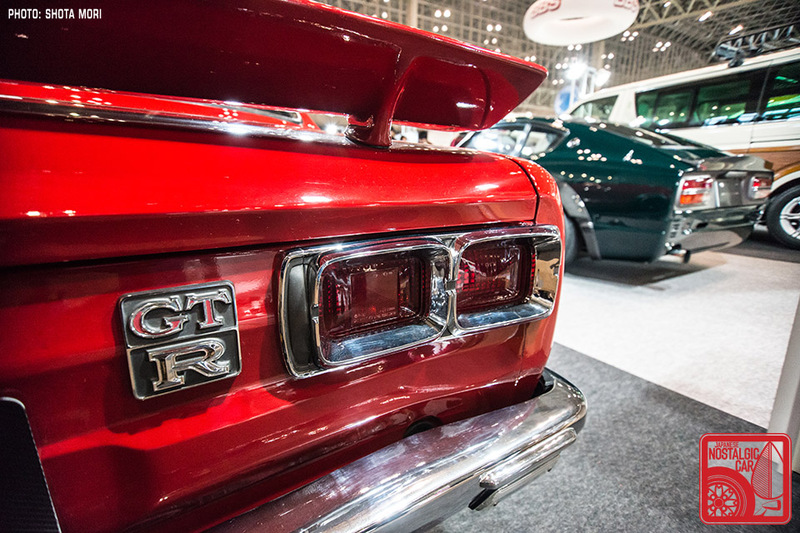 The chuuki Starlet was lowered on proper and period Work Equip 01s and equipped with a correct TRD hatch tail. 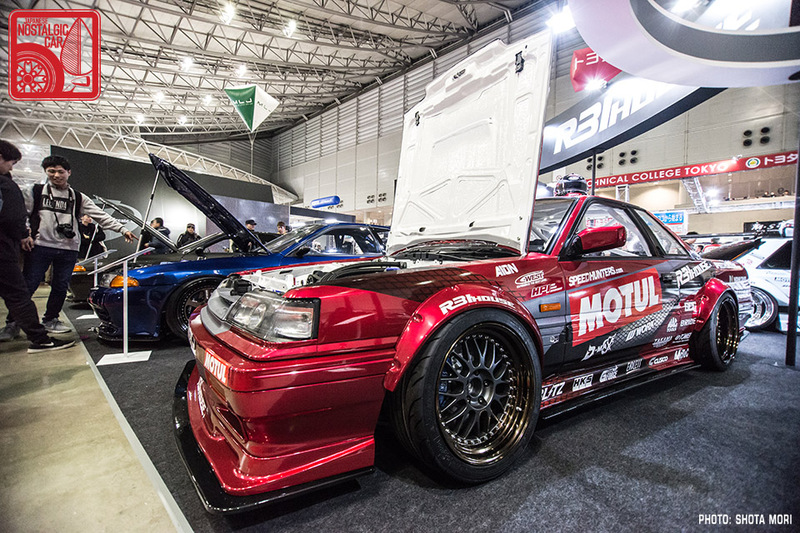 The R31 Skyline specialists at R31 House brought a duo of extreme examples of their preferred chassis. Their work ranges from the very stock-looking to specimen such as what could be a time attack machine. The graphic scheme is incredibly intricate, something rarely seen outside of Japan. Even with the canards, flares, and wing, it still look proper. The other R31 had its hood open, offering a peek at the firepower it was packing. 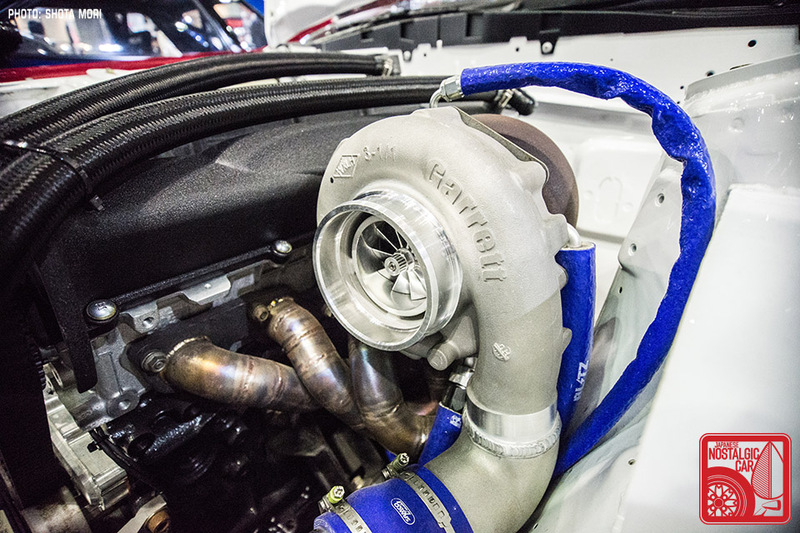 Turns out, it was a single-turbo RB26. 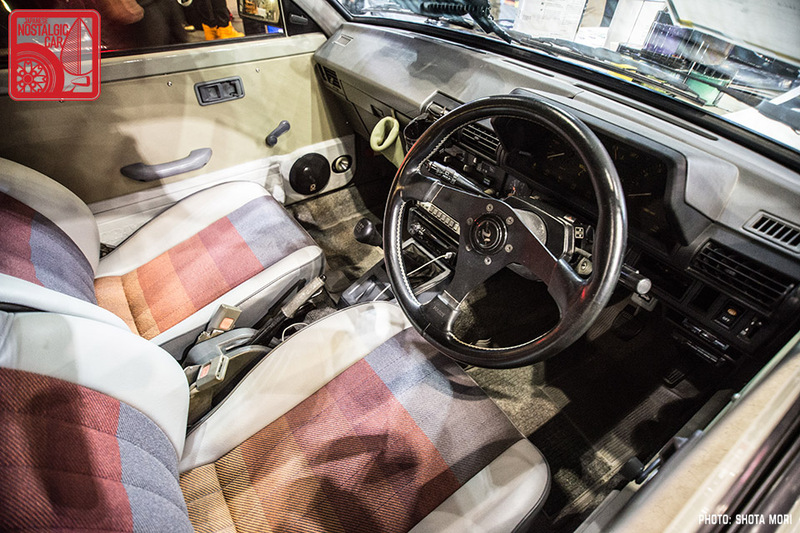 The interior was stripped too, probably for time attack, but the exterior took inspiration from SuperGT. For a 30-year-old car, the R31 still looks amazingly good, and R31 House has managed to assimilate them into contemporary tuning styles. 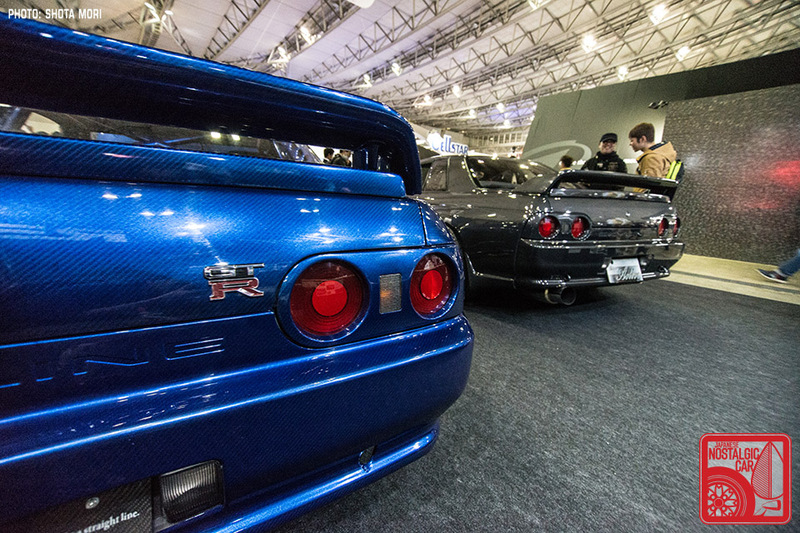 Garage Active is famous for its all-carbon R32 Skyline GT-Rs, and they brought two of them to the Auto Salon. Look closely at the blue one and you’ll notice a carbon weave pattern. The body is made wider than stock, good for gigantic 12J Work Meister L1 wheels wrapped in Advan Neova AD08R tires. Under the hood is a full-tune HKS RB26DETT, good for 600PS and 521 lb-ft of torque, which can push the car to a 300kph top speed (186 mph) and a blistering quarter-mile time of 10.2 seconds. The gunmetal one is even more insane, putting out a claimed 950PS and 665 lb-ft, which propels it to a 310kph top speed (197 mph) and a quarter-mile time of just 8.7 seconds. 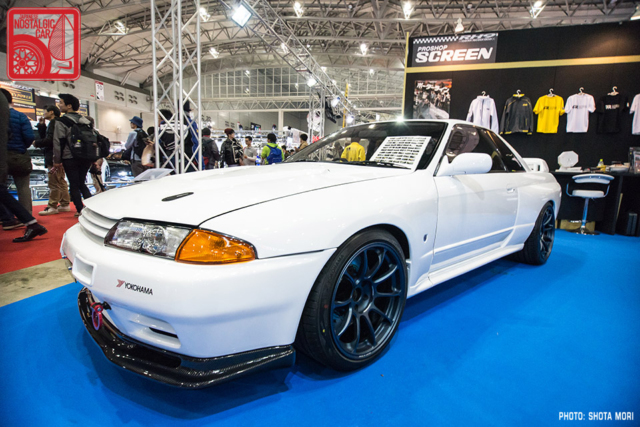 Despite the fact that R32s are old cars now, tuners are still finding ways to build completely mad ones. A bit more tame but perhaps preferable to purists was the Pro Shop R32. It’s been completely gone over to show that you can refresh an R32 to a like-new state. It’s really good to see that the market for R32s is still healthy. 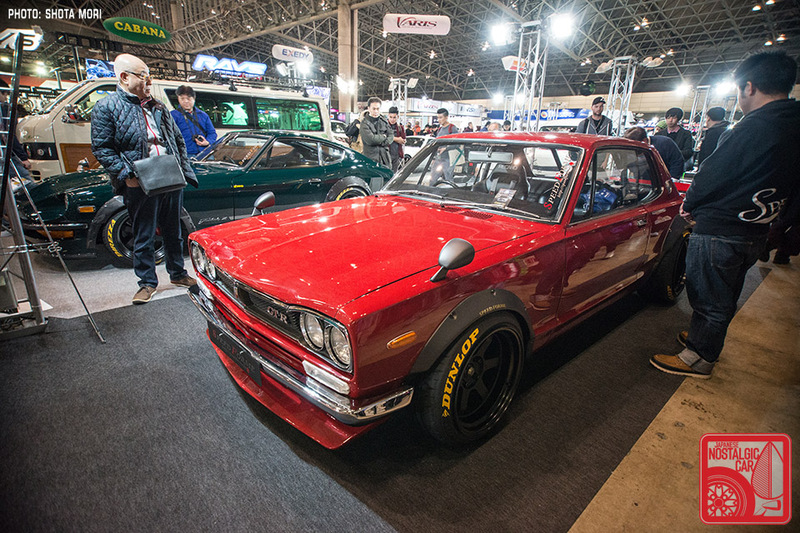 These days, around the world, the R35 GT-R has taken off as a drag and standing mile car, but long before them were drag cars like the Fujimoto Factory R33. It hails from the late 90s as evidenced by its Maziora paint job. Sadly, drag racing is thin on the ground in Japan, especially since the only quarter-mile strip in the country damaged during the Tohoku tsunami and quake. 2018 marks the 50th anniversary of Tomei, and what better way to celebrate than to showcase the company’s Hirota B110 TS Cup Sunny. Until recently it ran Toyota TOSCO wheels, but to celebrate the half-century it received a set of 8-spokes from RS-Watanabe, which also celebrated their 50th anniversary recently. 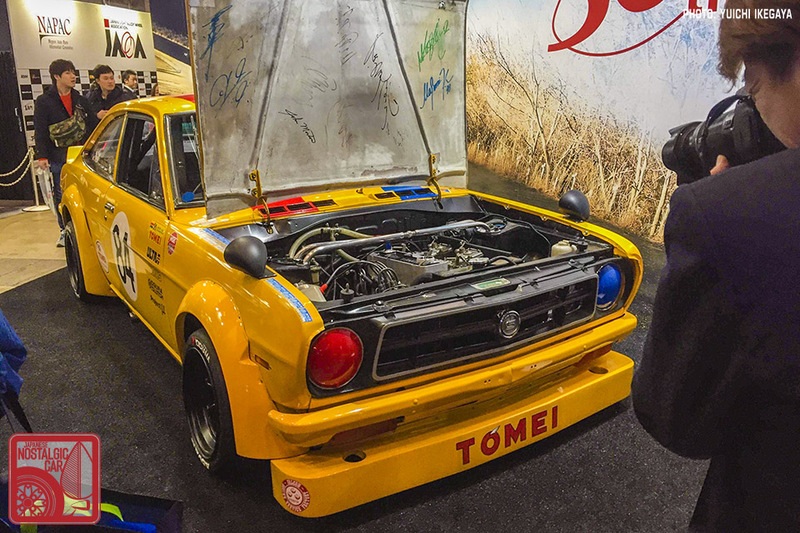 No B110 Sunny TS Cup car is complete without a Tomei full-race engine from the mother company itself. 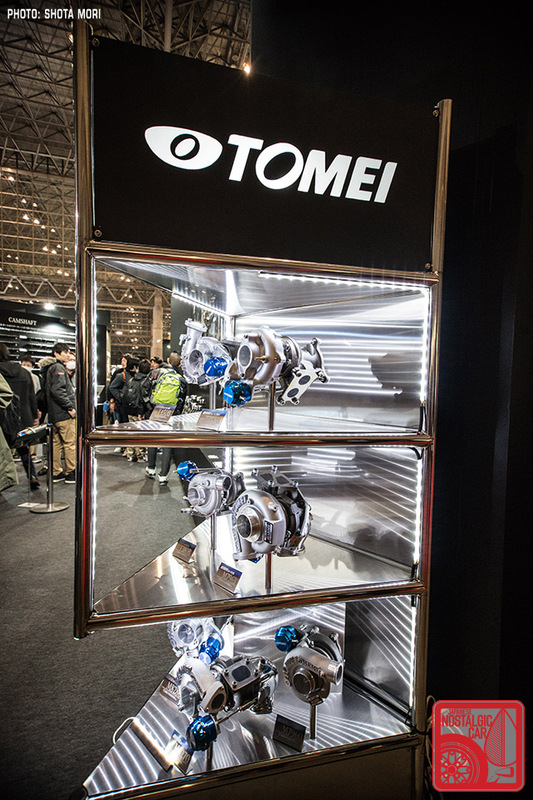 Equipped with their special high-lift cam ground at Tomei’s own engine shop, their A12 engine’s displacement is increased to 1.3 liters and is said to produce 170PS. The Sunny is owned by the brother of Shuji Suzuki, the president of Tomei, and it has been around forever. Attesting to its age is the orignal logo on the hood latch block-off plate. If you look at the hood’s underside, you will see autographs from racing greats like Kazuyoshi Hoshino, Masahiro Hasemi, and John Morton. 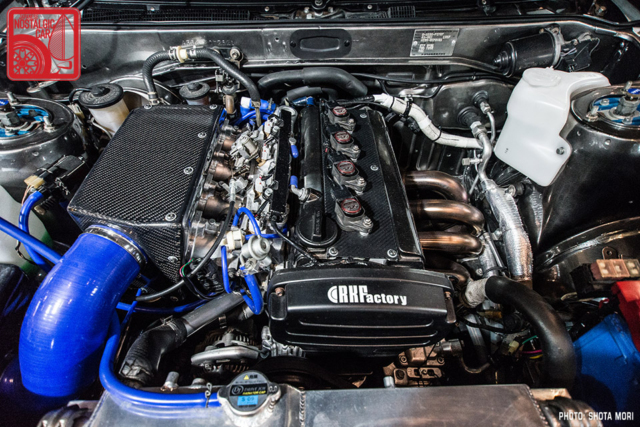 For fans of modern tuning there was a full-tune RB26DETT whose cylinder block and head have been fully prepped with pistons, connecting rods, and crankshaft all strengthened with forged Tomei parts. 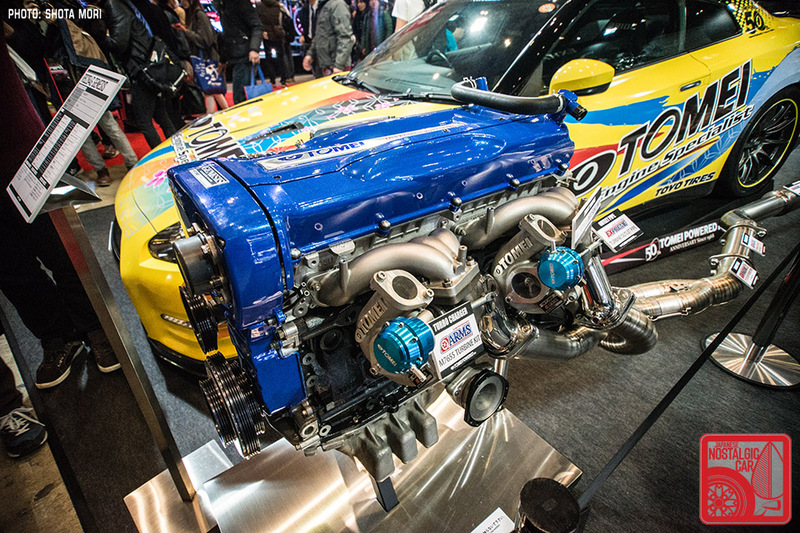 With displacement to 2738cc, 270-degree Tomei cams and Tomei’s Arms M7655 turbos, the engine has been re-christened the RB284G Genesis. 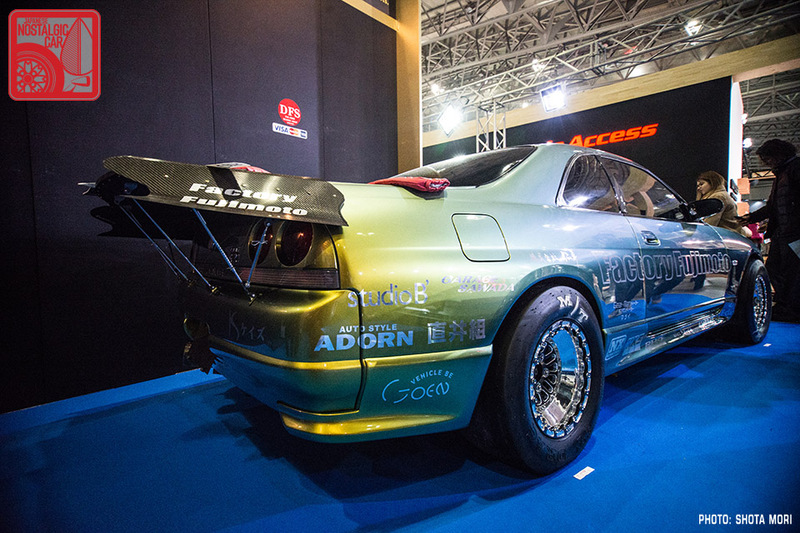 We end this segment on cars representing probably the Japan’s most influential form of motorsport, drifting. 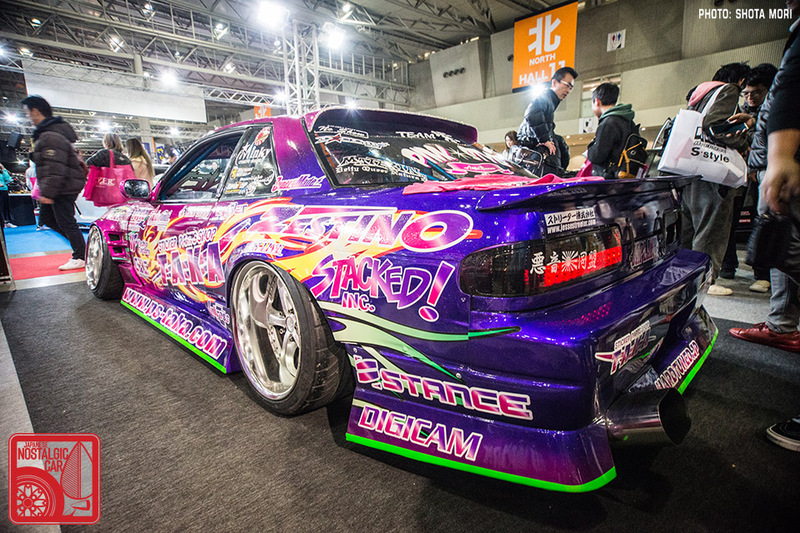 On full display in its screaming magenta graphic scheme was Naoki Nakamura’s S13. With his mind-bending reverse-entry drifts, Nakamura became an instant sensation. He brought this very car to the US to introduce his unique style, which has been captured by numerous videos. One of my favorite drifters is Kazuya “Chunky” Bai. Bai was one of the earliest drivers to bring the sport stateside, and made a big impression on everyone he met and who saw him sling his car in ways most Americans had never witnessed before. 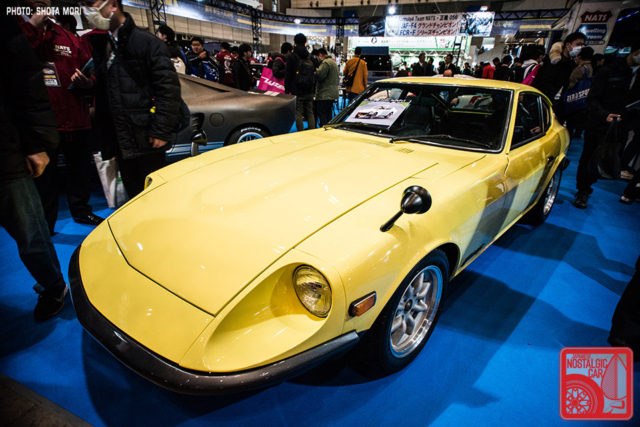 Japan’s car culture is so incredibly diverse that even all these years later there are still cars to thrill and delight enthusiasts. 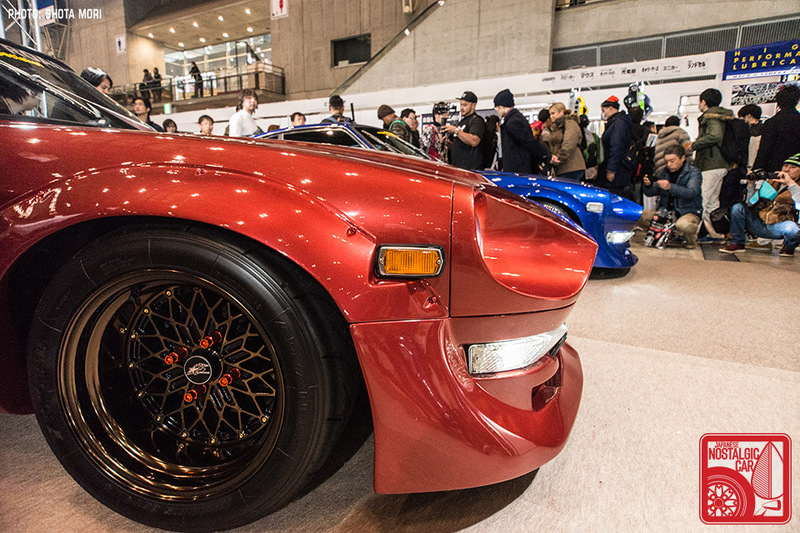 That’s just one of the many reasons why the Tokyo Auto Salon is a bucket list event. In case you missed it, more 2018 Tokyo Auto Salon can be found with spotlights on the Endless Hino Contessa, Alaska-to-Chile Toyota Land Cruiser, Toyota’s Gazoo Racing booth, the TOM’s KP47 Starlet, Banzai Sports Sunny Truck, Nissan and Mitsubishi’s booths, cars of woman-run tuning shop L-Tide, Yokohama’s reproduction tires for kyusha, Liberty Walk’s Advan-livery Hakosuka, Honda’s retro-inspired hatchback, a Daihatsu Charade De Tomaso, Subaru Rally Legends, and RE-Amemiya’s Cosmo Sport. 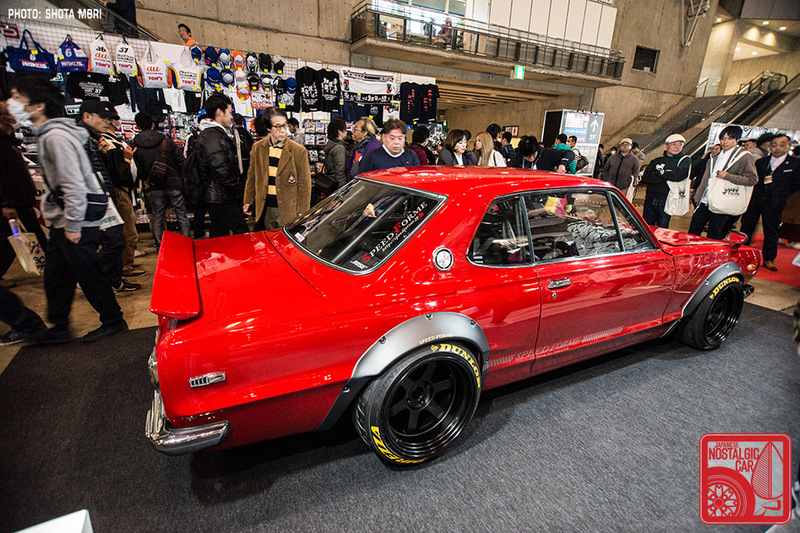 tagged: 2000gt, ae86, b110, c10, corolla, corolla levin, drifting, fairlady z, g-works, hachiroku, Hakosuka, kp61, mazda, miata, mx-5, nissan, Obayashi Factory, r31, R31 House, r32, rocky auto, s13, s30 z, skyline, sprinter trueno, star road, starlet, sunny, tokyo auto salon, tomei, Top Secret, toyota. The S13 and RPS13 always remind me of Signal Auto. 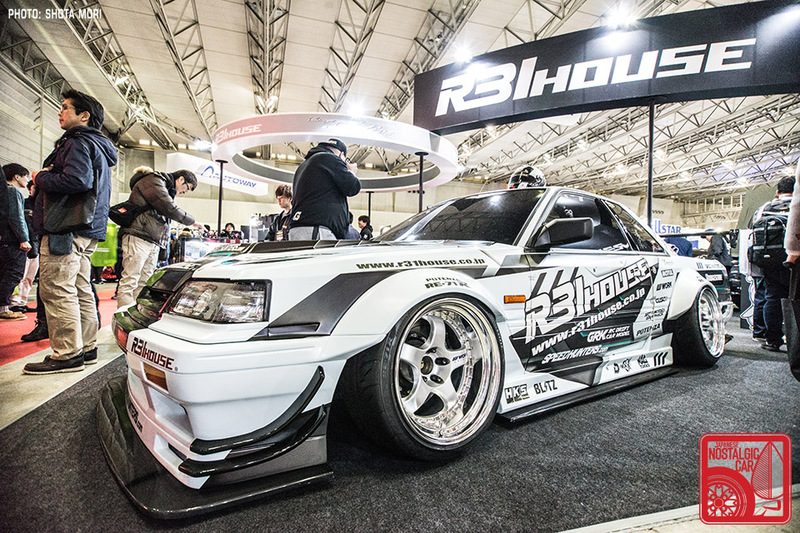 Star Road and R31 House are favorites . Nice to see so much cool stuff from TAS 2018 !! The 2000GT is nothing short of amazing… are they planning to produce more? They have made a handful, so I think that as long as customers have the money they will build more. Correct me if I’m wrong but is that the so called Rocky 3000GT? In some Japanese magazine I had they offered Convertible version too. Thanks for confirmation Ben, I think they made one with Lexus V8 too. You gotta love Rocky Auto. Fantastic, any idea what they sell for? They are made to order and you an email the company for an inquiry, but the list price isn’t advertised on their website. I really love the 110 Sunny, it’s such a classic look and livery. Nice! Love the cars from Speedforme and R31 House. 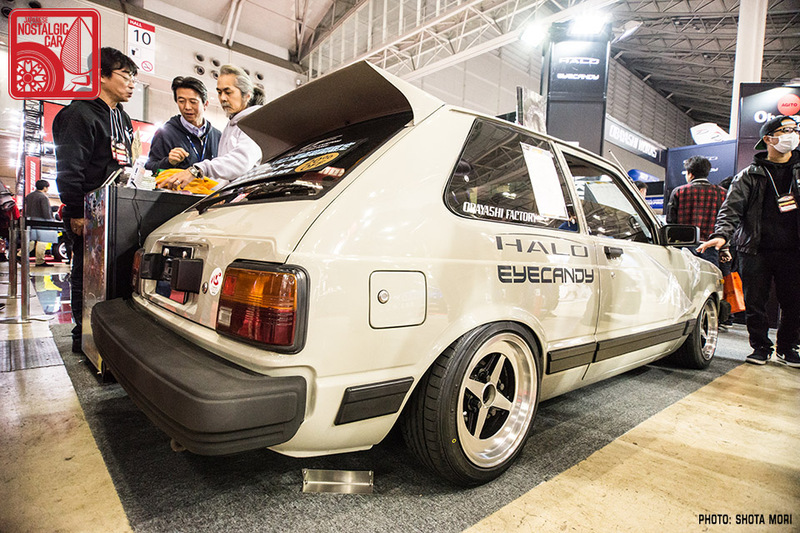 However, I do believe that is an EJ, not a FA20 in the AE86. 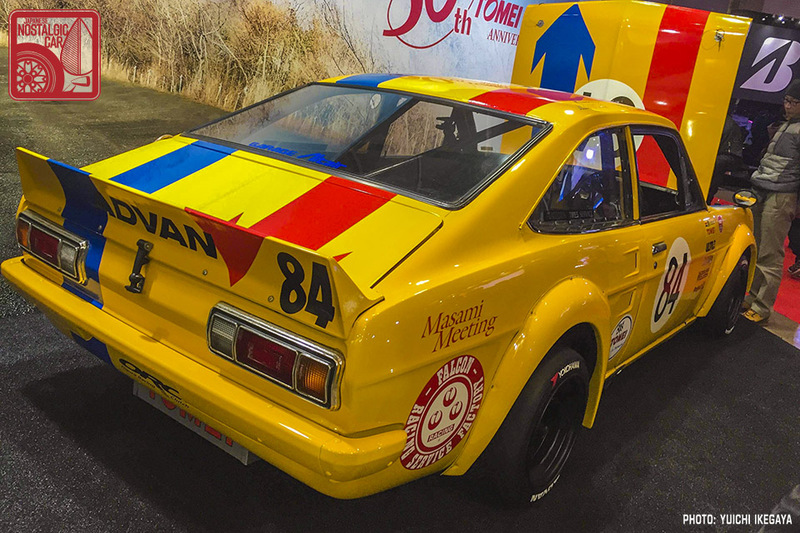 One thing I’m noticing is the fixation on thirty-forty year old cars, with little interest on more recent cars. It seems like old white guys who are fixated on 1957 Chevy and 65 Mustangs. Sure AE86, S30, et al, are great cars, but I gotta say it’s getting a little tiresome seeing the same cars over and over again. Maybe it’s because they CAN’T modify newer cars with variable cams, direct injection and the like. 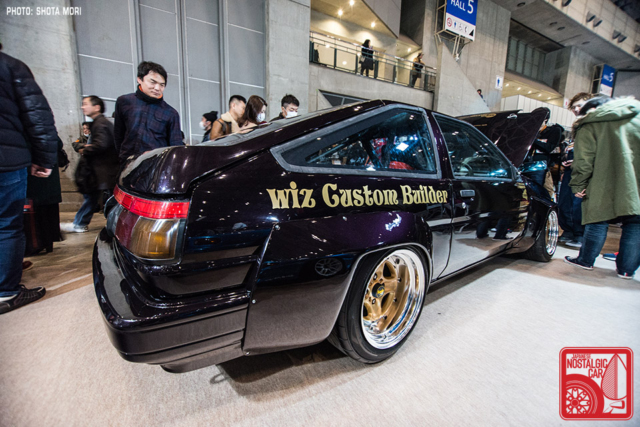 Sure, you can’t drift an AE92, but I’d like to see a modded TE37 or B210 hatch. That’s why we highlighted cars like the KP47 Starlet and Daihatsu Charade De Tomaso in previous installments of our Auto Salon coverage. However, S30 Zs and AE86s are still an important part of Japanese car culture and there are dozens of ways and styles in which to modify them, so they deserve come coverage as well. 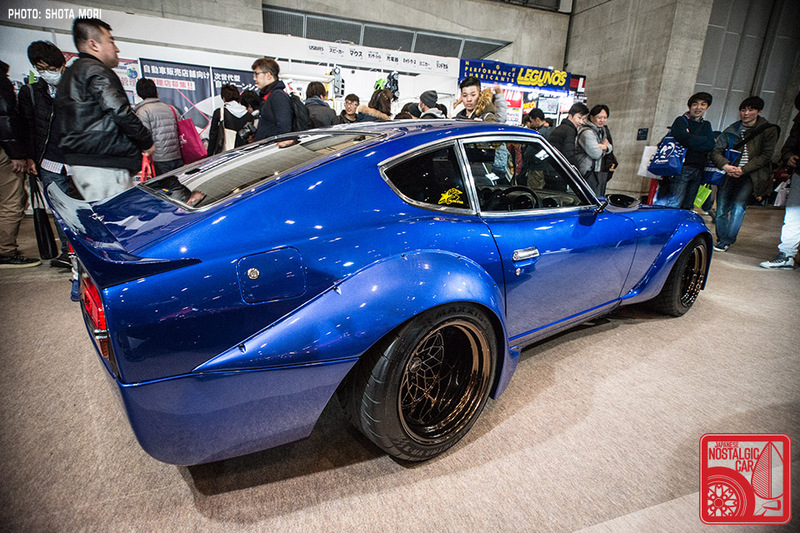 I’m not usually a fan of body kits, but the SpeedForme one for the Z is the epitome of “tasteful”. Nicely done!